LISBON- Lisbon itself has lots to delight; from taking an old electric tram up the steep hills of Lisbon to whizzing up to the top of the Santa Justa Elevator to get a panoramic view of the city of Lisbon. 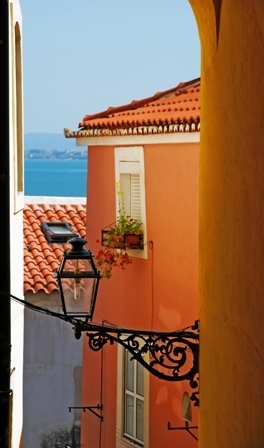 Do visit Alfama (the old quarter) and be sure to wear comfortable rubber soled shoes to avoid slipping on the cobbles. In the evenings, take in a Fado evening over dinner in one of the many restaurants in this area. Bairro Alto is also wonderfully lively at night – lots of restaurants, Fado houses and late night bars/clubs. For the adventurous and not faint hearted experience Lisbon's nightlife... It starts the latest and lasts the longest in the whole of Europe! Visit Bairro Alto, the cobbled streets of Lisbon in this area become alive at night as people's front doors are opened to reveal several little bars and clubs.. People spill out onto the streets and to enjoy Lisbon's very own unique form of open air nightlife. 12TH JUNE- June 12th is the night of the Festival of St Anthony; the best night for trying traditional sardines in Lisbon. TRAMS- Go by tram - #15 is the best - to Belem. It leaves from Praça Figueira and stops at Praça do Comerçio and Cais do Sodré before going on to Belem - a wonderful place of fountains, parks, monuments and monasteries. LOCAL PARK- For the very young or young at heart, take a stroll through the local park. Parque Municipal da Gandarinha in Cascais is located opposite the marina and beside the cultural centre.. Feed the ducks - or just sit at the local café and read a book whilst the peacocks strut around you. LOCAL MARKET- If you're an early riser, catch the auctions in the fish market square where the fishermen sell their daily catch. Property is within 5 minutes walk of the Cascais fresh produce market - market days are Wednesday (full market day) and Saturday, (fresh produce). ACTIVITIES- Local activities include diving, surfing, swimming,tennis, walking, sailing, cycling, fishing, horse riding, golf, wind-surfing, water skiing, mountain biking, mountaineering, roller blading on the purpose-built pathway along the coast road. PARQUE MARECHAL CARMONA- One single space resulting from the marriage of the gardens of the Palace of the Conde of Castro Guimarães and the property of the Visconde of Gandarinha. Apart from an abundance of exotic trees and shrubs, the tranquility of this park offers curious hiding places to quietly read a book or romantic tree lined pathways. Wander around the small ponds, infant playground, mini zoo, aviary, youth library, duck pond, café, museum, chapel, rose gardens etc... Right in the heart of Cascais! Open 8.30-19.45 summer & 8.30-17.45 winter. BICYCLE HIRE- Bicycles can be hired locally (no charge) in Cascais and there is a bicycle path which stretches for miles along the beautiful coastline to Guincho Beach. ARTISAN FAIR-The Artisan Fair in Estoril (behind Casino) each July and August offers handicraft and a variety of restaurants serving traditional food. SINTRA- Sintra is a world heritage site and has a lot to be seen, including the Moorish Castle, Pena Palace, National Palace and the mysterious Quinta da Regaleira. It also offers great shopping and restaurants. Markets in Sintra are on the 1st and 3rd weekends of each month. ERICEIRA-The delightful old town of Ericeira takes you back in time to the days when it was a tiny fishing village. Cobbled streets, white-washed houses and a plethora of restaurants and cafes offer excellent food, especially the sea-food for which Portugal is deservedly famous. FURTHER A FIELD- Worth visiting in the Estremadura and beyond are, Óbidos, Sintra, Azeitão & Setúbal, Fatima & Nazaré. Alentejo is a little further (about 2 hours) but worth visiting are Évora and Monsaraz. The Esporão Wine Estate is worth having lunch at if you are going as far as Monsaraz.